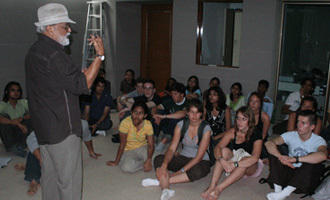 25 students visited MET on an International Student Exchange Programme. The students were Tablers from International Round Table, England and visited MET under the Young Ambassadors Programme. The students were mainly from Europe - England, Germany, France, Belgium, Switzerland and Austria. The idea was to showcase the world-class infrastructure facilities and intellectual capital housed at MET. The students had insightful interactions with Prof. Sushil Bahl, Former Director - MET Institute of Mass Media and noted film director & MET faculty - Vikas Desai.